Rediscovering the Magic of Christmas! For the past week, my 5-year-old son has been sprinting into our bedroom right after he wakes up and announcing how many days there are left until Christmas. The wonder and excitement shining in his eyes is contagious. Boy do I wish that I could bottle that feeling for those of us whose stomachs are in knots over our to-do lists before Santa’s impending arrival! Rather than enjoying the merriment of the season, so many of us are feeling stressed and exhausted by thoughts of card sending, gift buying, and present wrapping, which loom like sugar plums over our heads. When anxiety kicks in, I try my best to take a step back and remember the true spirit of the holiday. This year, it’s my children who have really been shedding light on how magical this time of year is, and reigniting the hyperactive joy that I felt when I was a kid. From watching classic Christmas movies with my kids to driving around at night checking out our neighbors’ personal Winter Wonderlands, I can feel the magic of Christmas enveloping me. Our eyes are wide as we gaze upon the beautiful Christmas lights, and our spirits are jolly as we belt out the lyrics to Christmas carols, giggling through the words we don’t know. While being whisked off to “The North Pole” on a holiday train ride, I thoroughly enjoyed listening to my son ruminate over how Santa will get down our chimney and strategizing the best place to put his cookies. My 2 ½ year-old daughter, on the other hand, is still deciding how she feels about the round man in the red and white suit who’s judging her every move, yet she repeats “Santa is my friend” like a mantra. 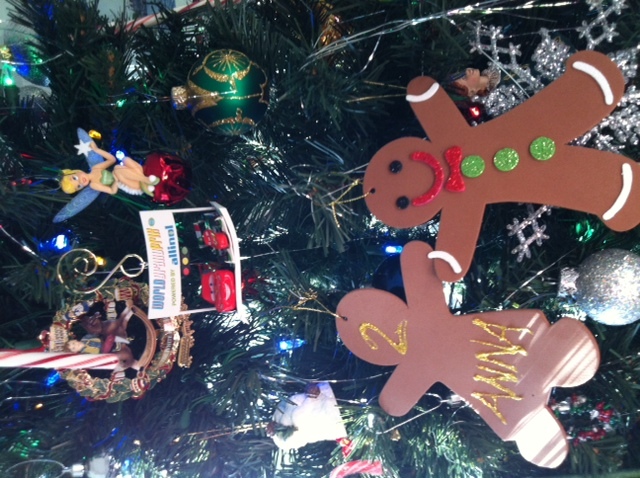 Their uncontained excitement over the holiday has inspired me to create new family traditions. Over the last few days, we’ve baked and decorated cookies with my cousin and her family and got crafty by designing our own foam Gingerbread boy and girl ornaments. I also bought ornaments that represent what my kids are going gaga over this year; a Cars 2 ornament for my son, and a Tinkerbell one for my daughter. I’ll do this every Christmas, and as the years progress, we’ll see how their interests have changed. It’ll be our own holiday-themed time capsule! 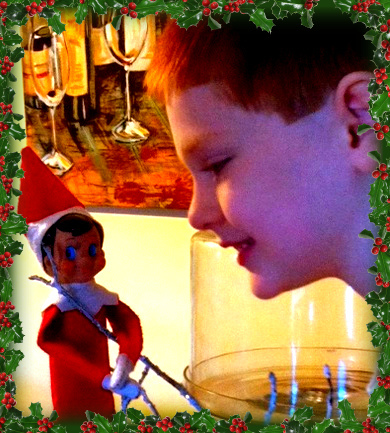 Another way that I’ve rediscovered the magic of Christmas is by watching my kids interact with Tinsel, our Elf on the Shelf. Christmas has also always been about being nicer to people—and not just because you want to avoid Santa’s “naughty list”. Tinsel has been keeping the wee ones in check since they know he reports back to his big boss Santa about their behavior. Each morning, Tinsel appears in a different location in the house after he comes back from the North Pole. 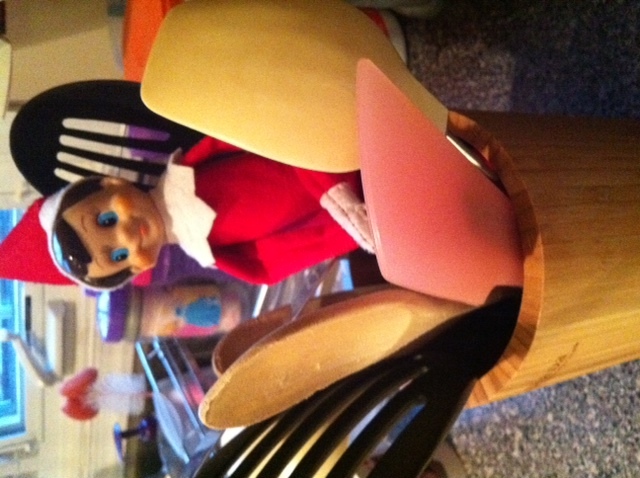 Today he showed up in our utensil holder on the kitchen counter! My husband and I love listening to our kids ponder where he could possibly be as their little feet scamper through each room. I chuckle under my breath when I see them presenting their artwork or goodies to the elf or cracking silly jokes in an effort to win him over. And they would never dare touch him, because that know that if they do, he’ll lose his magic. It’s their belief in his magic—and the magic of the holiday—that has me looking at Christmas through my children’s trusting and untainted eyes. 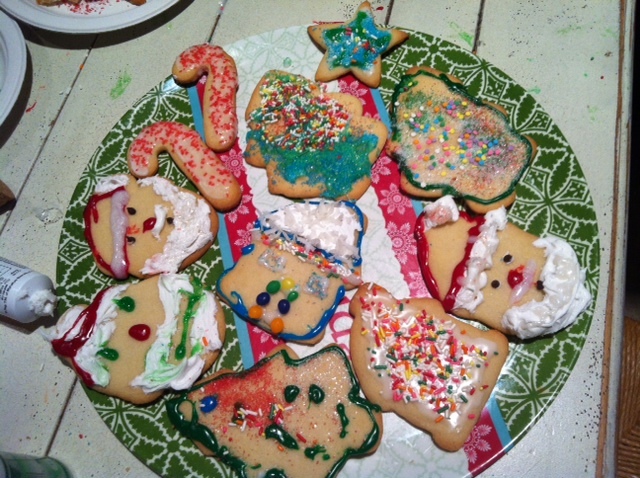 During this festive time, we traditionally swap lots of recipes, especially for Christmas cookies. This year, however, I’d like to switch things up a bit and exchange recipes for rediscovering the magic of Christmas. Here’s mine, inspired by my children, and I’d love for you to share your ingredients as well. Let’s keep our bellies and hearts full of wonder and belief during this special time of year! And some mistletoe leaves to encourage you to kiss someone you love.